Add / Remove the selected gameobject into scene, with a single click. Assign clone object ‘s parent. Assign clone object’s spawn position at scene. Config the cloneable maximum number. when something go wrong you may easier to found out by their number. 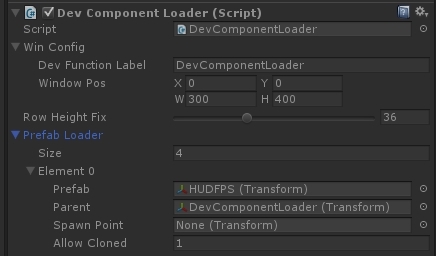 Create a empty gameobject, add “DevComponentLoader.cs” at than object. 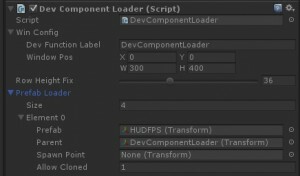 design how many gameobject / perfab you may want to load in game. drag the Gameobject or Perfab you want to be clone in game. setup clone object’s transform parent. the transform location of the global scene. the number to control the maximum number of cloned object. 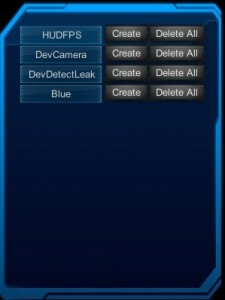 After setup you DevComponentLoader now you may run the game. Switch on “DevComponentLoader” on Dock. then you will see the GUIWindow like this. Now simply just click on “Create” button, there you will found your object was created. Also you can use “Delete All” or “Delete” button to destroy gameobject you created before. The end of DevComponentLoader description.